The region of Taranaki in New Zealand is known for its spectacular scenery and geographical features including Mount Taranaki, rugged coastlines, rainforests and national parks. Often referred to as ‘the energy province’, the region is a major oil and gas producer, providing employment for many people emigrating to New Zealand. We asked some of our customers who have made the move, what is it like to live there and how easy was it to settle into life in the region? Read our customer’s stories below. Chris and I are not your typical couple, I’m an engineer and he’s a photographer, so it is my work that dictates where we live. We had joked about moving abroad but never did anything about it until I was told I was at risk of being made redundant. We’d just seen an advert for an emigration expo in London, so decided to check it out. We picked NZ because it’s not as hot as Australia and the wildlife isn’t trying to kill you. We’d also worked with a few Kiwis and one thing we noticed is that they all returned to New Zealand. We talked about it for a while and decided that we would give it two years. If we didn’t love it and missed family too much we would return to the UK. We didn’t tell our families until we knew we had the visa., Telling them was not easy, but my Nan told us to go for it as there is nothing worse than looking back on your life and thinking if only …..
We made the effort to make new friends; if we were invited out we would accept it. If you talk to people then they will talk to you and we have found this to be especially true in New Plymouth. People here are very friendly and we have made some great friends since we’ve been here. I won’t lie, we do miss our friends and family at times, but we still talk as much as we did in the UK. We have been in New Plymouth for 3 years now and love it. We have the beach on our doorstep, Mt Taranaki as a beautiful backdrop and Auckland & Wellington is within a 4-hour drive. Our advice to anyone is, do your research and if you still think it might be for you then go for it. We moved to New Zealand to ultimately spend more time together as a family and enjoy a better life. I’d worked for 25 years on a chemical plant in the United Kingdom and decided it was time for a change. The family were still quite young, 8 and 5 at the time so the scene was set. We had been thinking of emigrating for a number of years, considering Australia as the favourite place. I saw an advertisement for a job in New Zealand and when we started to research Taranaki as a province, we liked the look of the place. We came out for 2 weeks as part of an interview process late in 2006 and we immediately fell in love with the place. The opportunity for a much more relaxed lifestyle, warmer winters (no frosty mornings) was just too much to resist. In Nov 2006 we contacted John Mason. We were recommended them by a friend of ours who had emigrated a year previously. John Mason made the transition from one side of the world to the other so easily. In February 2007 a team of 2 John Mason ‘movers’ knocked at the door. The next day, a container was reversing up our drive and our life was shipped in front of our very eyes. We found the emigration process simple and straightforward, which made the move to NZ that much less stressful. Early in April 2007 and we were contacted by John Mason’s moving partner in Taranaki. On 12th April 2007, the doorbell rang and the door to door service was completed. 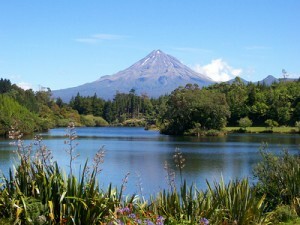 Taranaki is one of New Zealand’s best-kept secrets. It gets a bit of rain and is like the lake district in many ways, much ‘greener’ than Australia, plus there are no snakes, poisonous spiders or crocodiles here! Since moving to NZ we haven’t looked back once. The children settled into school well and we enrolled them in lots of after-school activities during the first year we were here. Schools produce more balanced individuals and focus on life skills as well as academia. Children here can be children longer here, there are no pressures to become young adults early. They are free to play outside and go to school or the shops safely. We chose to live in New Plymouth as it has so much to do. With strong links to the oil and gas industry, it is an affluent location. The walkway along the seafront is good for all sorts of activities. We have lots of wonderful parks and reserves. During the long summer holiday, there is always a large number of events organised, and most of them are free. Before we came here I’d never cycled or surfed, now I’ve cycled 150km around Mt Taranaki (our local volcano) and can stand up on a surfboard! My job itself is also very rewarding. It’s more diverse, there are less demarcation and a big overlap into other areas. Taranaki…. I don’t really know what else to say, apart from that we love the place. We are perhaps not typical of migrants to NZ, being around 70. We have come to join our daughter having 2 children and 5 grandchildren in Oceania. We hope to spend the rest of our lives here. The application process was quite onerous with notarised letters needed from all of our 4 children and very thorough and repetitive health checks. In all, it took 3 years for us to reach the top of the quota list. The staff of the London office were extremely helpful and available throughout…..a taste of the NZ ‘can do’ attitude. My advice to would-be migrants is ..just do it and soon! Our choice of Taranaki was dictated by our farming daughter and housing easy as we had a small holiday house already. We have bought a house in New Plymouth since and are really enjoying living there with weekly visits to the family. Buying a house in NZ needs some care with UK standards of insulation and heating mostly absent. A survey and builders report is essential. To people from Europe, NZ houses look insubstantial, you have to remember the reasons for light construction. We have found plenty of advice here in NZ about what to do next in the settling process. There are good libraries and information centres in most towns and a lot fewer official delays than in the UK. Transferring money is something to take advice on too.